Aie and Melai's mom were my mom's kabooth share! :) Heehee! Mich, Ate, and Aisa's Ate Patricia! Registration Booth People! Si mom and dad pa ang nagka picture with Victor Basa and Divine Lee! Haha! Mommies! My mom and Melai's mom! At the Nail It! Station: Patricia Prieto and Kryz Uy! Finally! Can't wait to road test Lorys hair cream (pedeng conditioner or hot oil!)! Ako na ang dry hair! And yey for the cute cupcake Ashley's lipgloss! :D Ang kikay lang! Big sale in the Accessorize stall! Ate and Pax bought a scarf from the stall, too! Free Oishi goodies and photo booth! Red Mango! :) My FAVORITE forever! Mastercard lakas maka-mayaman pen and bag! Hosts of the event: Gelo Arucan and Melai Entuna... With her mom for the "bring me" game! Sarah Tirona won Lorys and Sole Sister products! Gadgets Mag winners of new cellphones. Ang bring me: Oldest Cellphone! 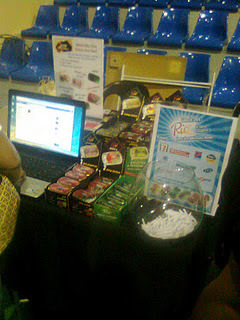 Thank you Mommy for manning my stall the WHOLE DAY! Thank you Kaye Awatin for this picture! Metal Collar Necklace and Gray many-ways Coverup - Cuenca Bazaar Find! Thank you to all the participating bloggers (mga tindero/tindera for a day! :)), the ever-supportive readers, our very generous and accommodating sponsors, our awesomesauce partner and Multiply.Com, the GMA Kapuso Foundation team, and EVERYONE who has been part of this event...Pre, During, and Post! 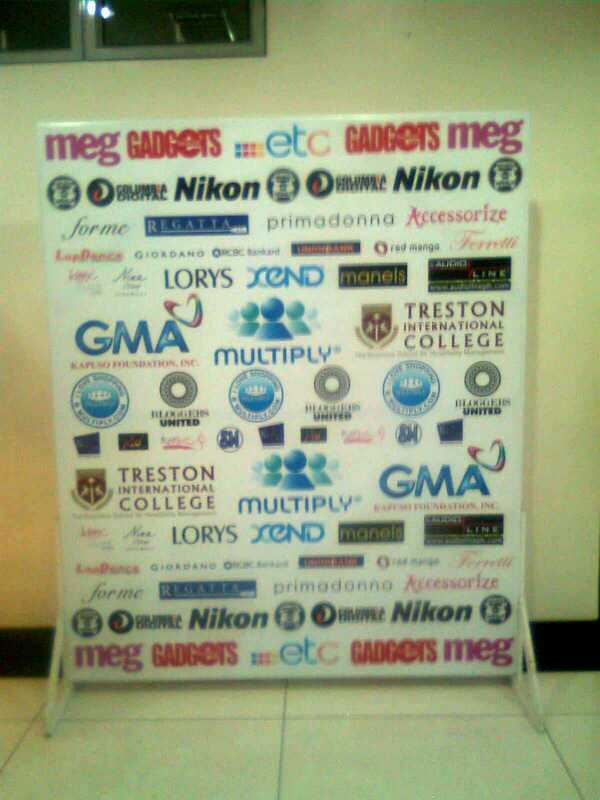 Photo wall with our beloved sponsors c/o Paul the PR Guy! Thank you! A BIG THANK YOU to my Crazy Gonzales family for the never ending (walang katulad!) na support. Daddykins took charge of the tables and chairs (balita ko may nagtaray sa dad ko na blogger nun nag ask lang sya if they need more tables and chairs sa stall..Grr. Kung sino ka man! Hay! God bless you! Haha). 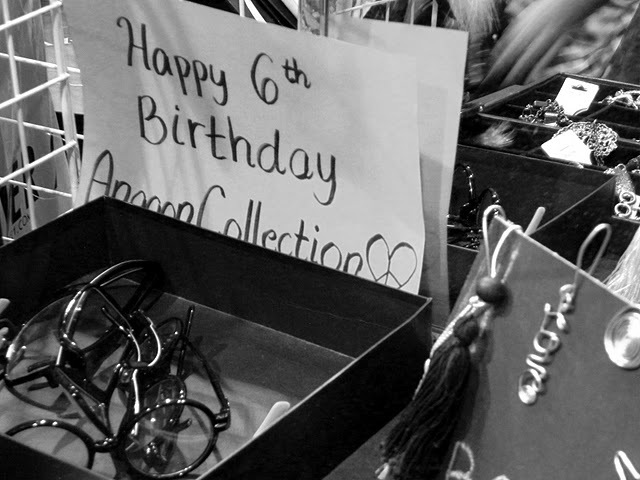 Mom was my tindera in the Anagon Collection stall (boy did she sold a lot--good job sa sales talks mom!). Ate went to the event to help the registration area, and never left the station! Thank you to my sisters forever: Aisa Ipac and Melai Entuna. Hindi ko matutumbasan ang mad skillz niyo in event organizing, but I thank God for all these experiences shared with the two of you. Thank you sa lahatlahatlahat! :) Love you both! To God be the Glory! :) Thank You Lord for this blessing! I am proud to be a Pinoy Fashion Blogger! What a successful event! Congrats girls! Congrats Ana, sa inyong 3 ni Melai and Pax. :D super fun talaga kahit best in late kami ni ate kasi akala ko 1pm start. haha :D sa uulitin. havey na havey talaga ang bu2!! !thank you for mentioning my name pati po ung pictures hehe..ang labo po eh..thank you so much po tlaga!! love your blog! sarap basahin.. kuleeet..
ang solid lang ng write up na ito! ana, pax and melai, i can't congratulate you enough for another successful installment of Bu2 and for this time thinking of us Cebu bloggers as well. it was one of the best weekends talaga for us, to have met and joined all of you in BU and to give our city some sort of representation. ay dumadrama. sayang wala ka sa dinner though! love you ana! ANAAA <3 Congratulations :D BU2 was just awesome! !